July is a pinnacle summer month and with summer comes delicious seasonal berries, like the beloved blueberry. With the blueberry season just starting, it makes sense that July is considered National Blueberry Month. In honor of this small, vibrant, antioxidant-packed berry, we raise our cups of Blueberry Cobbler coffee (of course) and head to the kitchen for some delicious blueberry inspired breakfast ideas. Check out the collection of recipes below and you might just find your new favorite morning meal. This Blueberry Coffee Cake recipe from the Pioneer Women is a decadent way to start your morning. Whether you like to read through the instructions or watch a step-by-step video, the results will be a delicious way to enjoy your daily dose of blueberries. Pair with our Blueberry Cobbler coffee. Maybe you prefer a muffin with your morning cup of Joe. Not only does the blueberry add a ton of flavor, it also helps keep the muffin moist. Check out this recipe for the Sweetest Blueberry Muffin and pair with our Blueberry Cobbler Single Serve coffee. If you’re looking for an extra kick of blueberry, this recipe for Blueberry Buttermilk Pancakes takes the cake. Not only does the pancake batter have plump, ripe blueberries, you top it all off with a homemade blueberry maple syrup. Yum! If you want something on the lighter side, this Blueberry Breakfast Parfait from Food and Wine is a perfect way to get a protein and antioxidant packed breakfast. 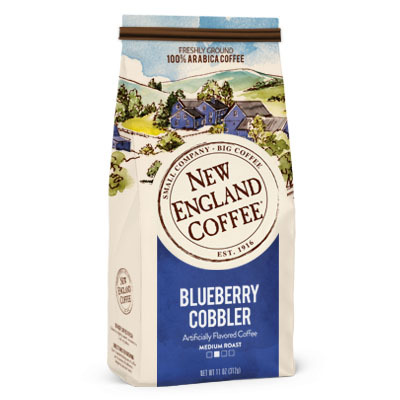 Just like these highly rated recipes, you can count on New England Coffee to deliver a consistently great cup of Blueberry Cobbler coffee each and every time. We’d like to hear from you. Let us know how your blueberry breakfast turn out in the comment section. Happy July! Love your Blueberry Cobbler coffee. Have a very hard time finding it. Would love to see it in k cups.